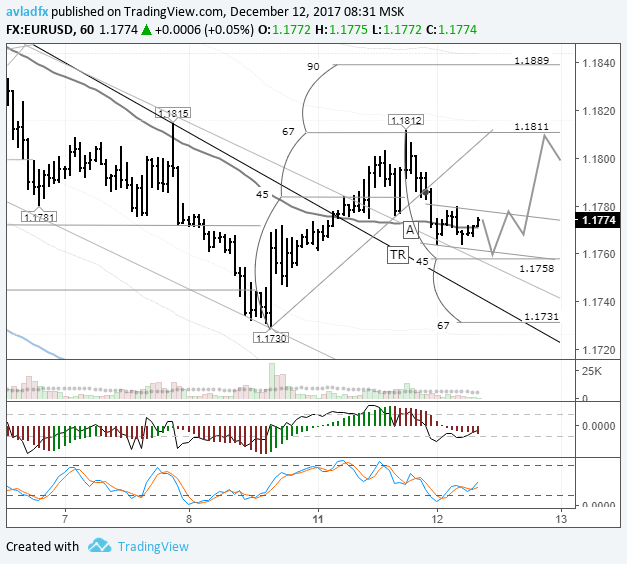 On Monday the 11th of December, trading on the euro/dollar pair closed slightly down, leaving a wick with a high of 1.1812 before dropping to 1.1769. With a bare economic calendar, market activity at the beginning of this week has got off to a slow start. Traders based their decisions mostly on the dynamics of US bond yields. In Europe, US 10Y bond yields dropped to 2.354%, before recovering to 2.391% in the US session. Growth for bond yields means growth for the dollar. 07:30 Japan: tertiary industry index (Nov). 09:30 France: nonfarm payrolls (Q4). 12:30 UK: CPI (Nov), retail price index (Nov), PPI input (Nov), PPI output (Nov). 13:00 Eurozone: ZEW survey – economic sentiment (Dec). 22:00 USA: monthly budget statement (Nov). 22:00 Eurozone: ECB President Mario Draghi’s speech. Yesterday’s predictions didn’t come off. With the euro crosses rising and US 10Y bond yields dropping, the euro broke up the A-A channel. The euro’s rise against the dollar was stopped in its tracks by the 67th degree. The EURUSD rate dropped to 1.1765. The 45th degree has shifted from 1.1730 to 1.1758 as a result of the 1.1812 high being formed. I think the euro is going to move upwards from the 45th degree towards 1.1811. On the daily timeframe, two candlesticks with diverging tails have formed a range of 1.1730 to 1.1812. The euro will continue to move in whichever direction it breaks out of this range. Markets await the FOMC meeting and Janet Yellen’s press conference on the 13th of December. They’ve already factored in a 25-base-point increase to interest rates, so euro bulls shouldn’t waste their energy trying to push the price up here. I’m thinking about opening a long position with a BuyStop at 1.1780. If the euro renews the 1.1764 low, then it may be worth risking a long position from 1.1758/60. These are preliminary values, they may need adjustment later.